Today we have a Design Team project from Holly - there's always so much fun in the build up to Christmas and these little moments are so worth capturing and scrapping. My friends little girl just looked gorgeous in her pink gum boots and dress helping her daddy get their Christmas tree I had to scrap the photos. 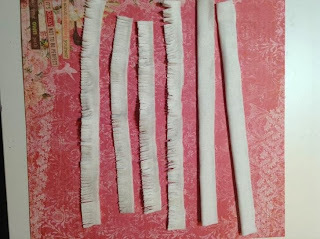 I started by cutting thin strips of calico fabric and folding them in half . Using 450 glue I glued along the cut edge. I then made small snips with scissors all the way along the folded edge as shown in the photo. 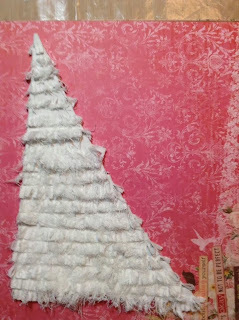 I cut a large triangular tree shape out of chipboard and then glued the strips down to the chipboard. 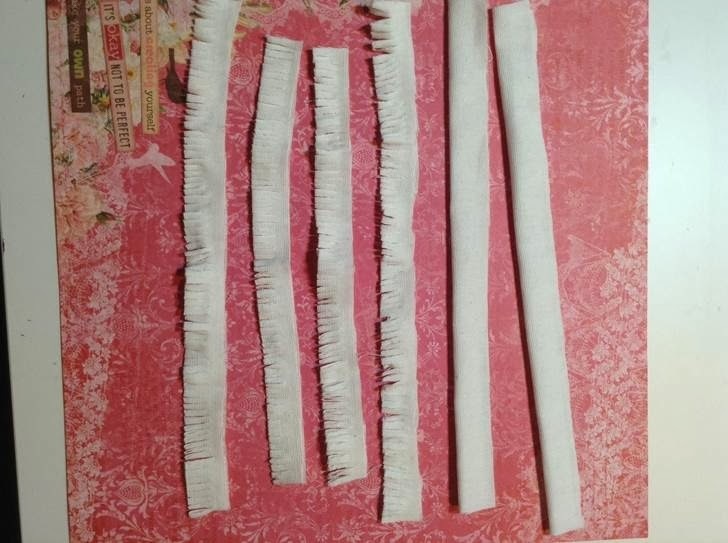 Once completely dry I used my fingers to rub the cut edges quite roughly until the material frayed and it began to look like a bushy Christmas tree! I then sprayed the whole tree using dylusions spray in Dirty Martini, glued some buttons on the tree as Christmas decorations and used treasure gold in the pewter colour to make the decorations sparkle. The Christmas presents were made from circles of patterned paper from the lovely Little Miss paper range from Bo Bunny. I folded the edges to create a dimensional present effect and then tied pretty ribbon round each present. I double mounted my base paper using the same range of papers and also mounted my photos to tie all the colours in. 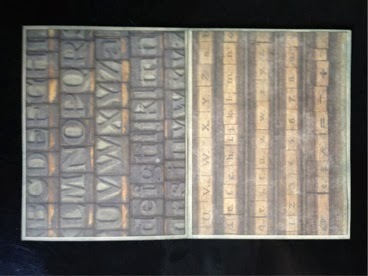 The chipboard letters were also sprayed with the dylusions ink spay and the edged with the pewter silver and the flourish was cut using the big shot and coloured with the treasure pewter. 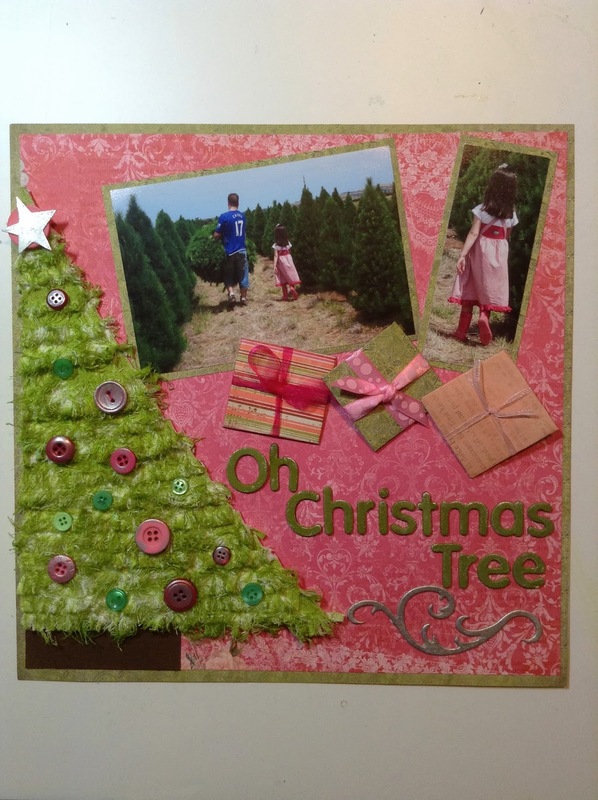 I love this page as I always automatically think that Christmas scrap pages should be in red and green - this page shows I can always think pink! Well, it's getting hotter by the day and just a little over 3 weeks to Christmas. 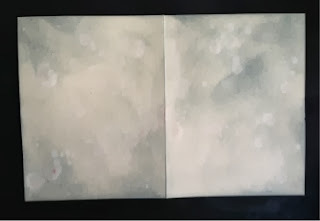 Today's project post is from Design Team member, Liz Aitken. It's an innovative and different way to present a gift card for a male - and we all know how hard it is to create interesting and different gifts for the guys, so give this one a go !! Well, Christmas is just around the corner and as I am not flying west to spend Christmas with my family this year, I have had to become the Queen of the Giftcard! I thought I would share with you a nice way to make a gift card just that little bit more special for the recipient. 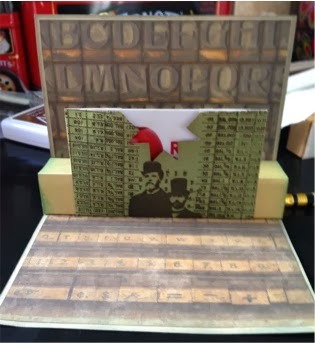 This is a vintage style card that has enables the gift card to pop up when you open it. 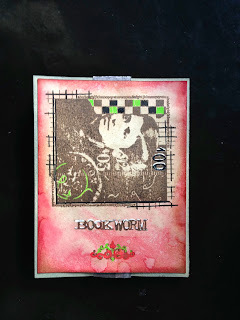 · Stamps of your choice - I used Paperartsy MN03, Backgrounds Plate 3 and Schooldays Plate 2. Archival Ink in your choice of colour (I used Potting Soil). 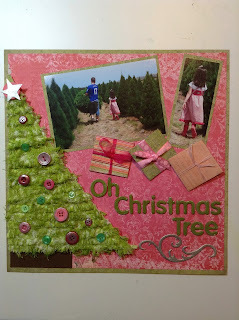 Add some of the same distress colour (Iced Spruce) to the outside of the card. Flick with water to get an aged look. Score each of the 10cm x 13.5cm pieces of cardstock or patterned paper at 2.5cm, 5cm and 7.5cm on the short (10cm) side. 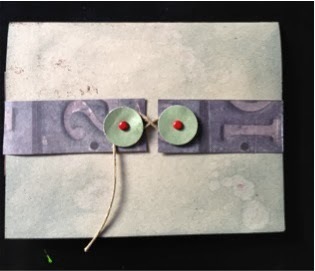 Hint: Using patterned paper as opposed to cardstock for this step will make the card less bulky and easier to close. Apply Evergreen Bough Distress Ink to the edges of the card. 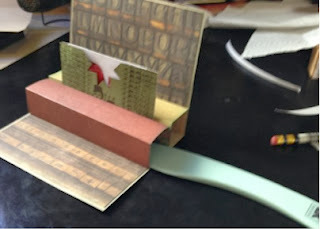 Attach one scored piece to inside of card. Start by aligning the unfolded but scored piece to the center score line, and adhere. 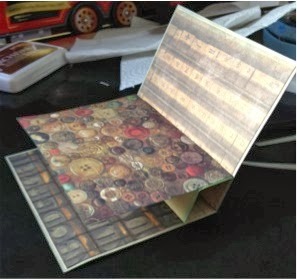 Then fold in half at the 5cm score line and close the card to adhere the other side to the card. Distress folded front edge with Evergreen Bough Distress Ink. 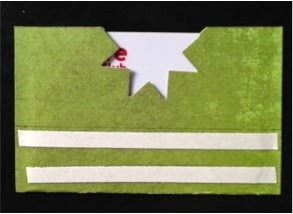 If your gift card did not come with an envelope, take a scrap of patterned paper, trim to size, fold in half and adhere sides. 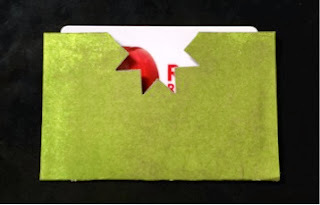 If your gift card has an envelope, cut the flap off. Punch either a pattern section (in this case I have used a Fiskars Jenni Bowlin Quilted Star punch) or a 1 3/8" semi-circle at the top of your envelope. 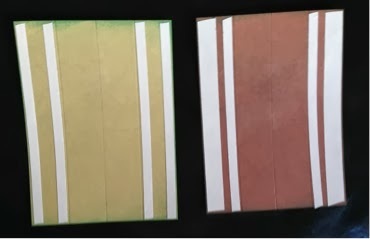 Flip the envelope and rule a line 2.5cm up from the bottom. 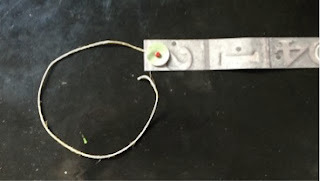 Place double sided tape underneath the line. Attach the envelope to the middle front of the pop-up piece. 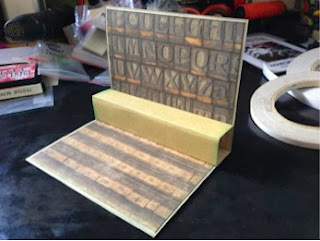 Align the other end of the scored piece to the base of attached section and adhere to card. Burnish well to ensure adhesion. 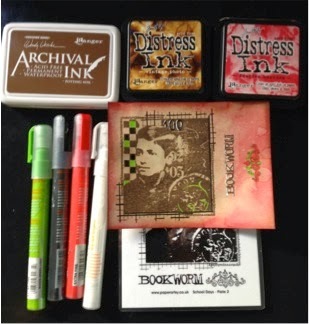 Distress the front of the scored section with Evergreen Bough distress ink. At this point add a sentiment to the inside of the card if desired. Punch two 3/4' Circle and attach to each end of your 27.5cm x 2.5cm piece of patterned paper with mini brad. Tie a reasonable length of baker's twine onto one end. Wrap the band around card and secure it on the back by wrapping twine around both posts. Add double sided tape underneath the belly band at the front of the card to secure. 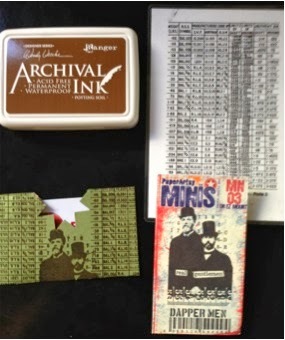 Note that you are looking at the BACK of the card here, not the front. Put aside. Take your 10cm x 13.5 cm piece of kraft cardstock and decorate. NB – I flicked water over this cover after applying distress ink in order to get a shabbier vintage feel to the card front. Viola! 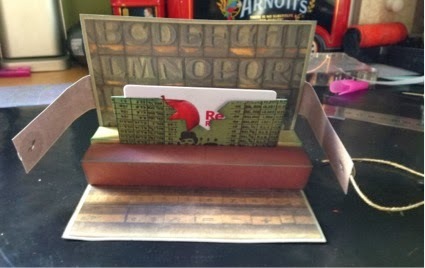 A pretty neat pop-up card for your gift cards this Christmas.